Ism is a Retrovirus by Matthew Hupert (Three Rooms Press) is a rock solid collection of 87 poems that examine life, lust, love, religion and politics in a word play phantasmagoria in which, according to poet Dean Kostos, “sound is meaning and syntax is thrummed like strings on a guitar.” A native New Yorker, Hupert probes his subjects like an true urbanite—in short, accessible works that seem like passing glances, yet resonate and bring increasing pleasure on multiple readings. Mondo 2000 editor R.U. Sirius raves, “Matthew Hupert had me at ‘shell my pistachio eyes. '” Beat Generation and Grateful Dead historian Dennis McNally enthusiastically applauds Hupert’s writing: “He sees how the words work, listens to them working, feels their meaning and spits ’em out. 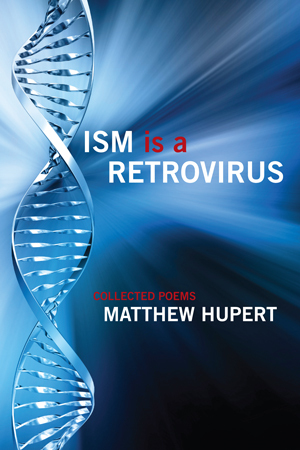 I love his poetry.” Funny, insightful and to the point, Matthew Hupert’s Ism is a Retrovirus is a song in a true modern American style praising beauty and grit of life with new insights in a determined, fresh voice. Matthew Hupert is a multi-media artist, a writer, and that rarest of birds—the Native New Yorker. He believes the primary role of the Artist is to be the stick that your Zen master smacks you in the head with. His poetry has been published in The Formalist, the contemporary dada poetry and art journal Maintenant, and the anthology 150 Contemporary Sonnets. He is also a multimedia artist and has done extensive work with musicians to create psychedelic visual environments. He currently lives with his son in Manhattan.